When you head into the wilderness, you want to have some fun, to see, feel and experience the wonders. But a dream can turn into a nightmare, putting you in a survival situation, injured or lost. Those are the situations this book prepares you for. 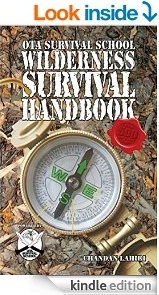 The Wilderness Survival Handbook is full of invaluable information, it tells you how to deal with a self-reliant survival situation. From constructing shelter to starting fires. From purifying water to setting traps and snares. About signalling and how to navigate. The basics of first aid. You learn about weapons and tools you can improvise from the hardware store that is Nature. This book is a compilation of some useful tips and tricks that everyone venturing out into the wilderness should know about. Literally, a book full of awesome. This entry was posted in Book Reviews and tagged Free Kindle Book, Free Survival Book, Wilderness Survival Handbook on January 9, 2015 by GunGuy.